Bitcoin price popped higher above $1210 against the US Dollar, and now BTC/USD is testing a major support area around $1206. There is a crucial bullish trend line with support at $1205 formed on the hourly chart of BTC/USD (data feed via Poloniex), which may act as a pivot zone in the near term. There were good gains in BTC to USD recently, as the price moved above the $1180 and $1200 resistance levels. There was a new weekly high formed at $1227 from where the price started a correction. The price has already moved below the 23.6% Fib retracement level of the last wave from the $1175 low to $1227 high. However, the price is now trading near a major support area which is just above $1200. It coincides with a crucial bullish trend line with support at $1205 formed on the hourly chart of BTC/USD (data feed via Poloniex). Moreover, the 38.2% Fib retracement level of the last wave from the $1175 low to $1227 high is also around the same trend line support at $1206. However, I think the more important support is just below the trend line at $1199. The 100 hourly simple moving average is positioned along with the 50% Fib retracement level of the last wave from the $1175 low to $1227 high at $1199. So, we can say there are many supports formed just around $1200, and the price is currently trading near it. As long as the price is above $1200 or $1199, it may bounce back in the near term. A downside break if happens could push the price towards the next important support at $1180. The hourly RSI for BTC/USD (data feed via Poloniex) is currently below 50 level, and struggling. Aayush has spent over EIGHT years as a financial markets contributor and observer. He specializes in market strategies and technical analysis, comes with an IT background. He possess strong technical analytical skills and is well known for his entertaining and informative analysis of the currency and commodities markets. Why Bitcoin Used In Ransomware Payouts? Why Bitcoin Is Loved By The Hackers? 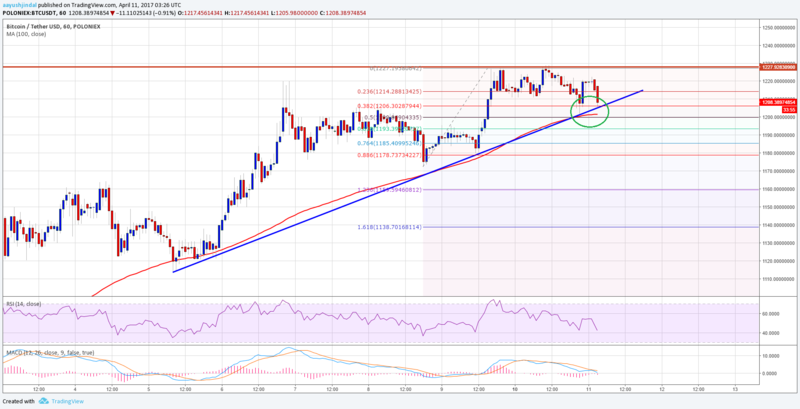 Bitcoin Price Analysis: BTC/USD About To Break? Bitcoin Price Analysis: BTC/USD To Continue Higher? Is Bitcoin Too Volatile To Be Of Any Use? sandton property tends on Bitcoin Lagging Behind Against The Real Race Of Ethereum? BinaryToday5.com on Bitcoin Price Analysis: BTC/USD To Continue Higher? Forex Robot Nation on Bitcoin Price Analysis: BTC/USD To Continue Higher? www.forexrobotnation.com on Ethereum Leading At Much Higher Rate Than Bitcoin? Bitcoinadvice.org © 2019. All Rights Reserved.